Try and come up with the most complicated equation you can think of. I cheated. My computer came up with this one. You may get an error if you try run the function depending on the precision of the program running it. keyboardhack wrote: I cheated. My computer came up with this one. You may get an error if you try run the function depending on the precision of the program running it. Laplace transforms which are used in aerospace mechanics technically extend to infinity depending on how much accuracy you want. The only thing possibly longer would be a power set of Laplace transforms which would have no practical use. Maybe not the most complicated equation I've experienced (diff EQ is all a blur now), but for solving local max/mins of cubic functions, I got Excel to solve for the real solution(s) to quartic functions in real time. My computer couldn't even handle this one! So I had to do it by hand.. took me hours. 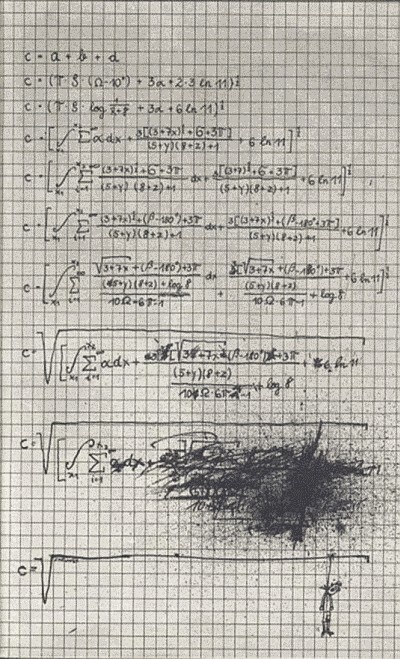 Mrmeguyme- wrote: Try and come up with the most complicated equation you can think of. The equation that describes how women work. Koub wrote: The equation that describes how women work. Not even the best computers can do such a large task. What about the legendary answer to life the universe and everything being 42? @koub where you found my classnotes from kindergarden?